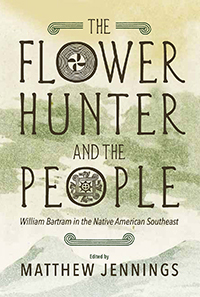 William Bartram has rightly been hailed as an astute, perceptive chronicler of Native American societies. In some ways he was able to see beyond the dominant ideologies of his day, some of which divided the world’s peoples into categories based on perceived savagism and civility. This was a noble effort, and worthy of praise more than two centuries later. Bartram could also use Native American civilization as a foil for an emerging white American society he saw as crass and grasping. Writing in this romantic mode, he was capable of downplaying the extent to which Native communities were fully part of the modern world that they and European invaders created together. THE FLOWER HUNTER AND THE PEOPLE tries to capture both of these aspects of Bartram’s works. Its main purpose is to introduce Bartram’s writings on Southeastern Native Americans, and to let Bartram and his indigenous consultants tell their stories in their own words. Along the way, readers should also consider this underlying fact, which rarely strayed from the Flower Hunter’s mind. William Bartram was a guest in the Native Southeast. He traveled on paths smoothed, figuratively and literally, by Native Americans. He stayed in Muskogees’ houses, ate Cherokees’ food, and was, at times of their choosing, permitted glimpses of his hosts’ worldviews and lifeways. It would be too much of a stretch to say that Native people co-authored the passages concerning their societies in Bartram, but the things they allowed Bartram to record bore cultural and political weight in their own times, and they can speak to us in ours as well.